San Marko Formals & Fine Men's Wear in Yonkers carries a large variety of suits and tuxedos to rent or buy, as well as accessories to help complete your look. "Stay fresh with notifications in your inbox. https://subscribe.mainstreethub.com/email/f8535779-332d-4b28-8fd0-3675b940317d"
"How would you rate your style?" "From business casual to formal wear, we're the spot for you. " "If you let us get you situated for prom, we might even throw in a free slow-dance lesson with your tailor. " "Prom limo means poppin' out of that vehicle looking extremely fresh. " Outstanding service and selection. If you go anywhere else for formal wear... you're crazy. Best Tuxedo shop around!!! Big selection, professional, and very courteous. Yes, I'd like to receive news from San Marko Formals & Fine Mens Wear. 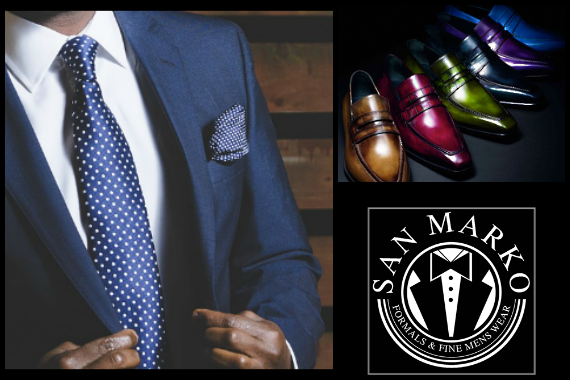 Sign up for the San Marko Formals & Fine Mens Wear Newsletter!